Defending national champion and No. 1 preseason ranked Alabama, along with No. 2 Clemson, No. 3 Georgia and No. 5 Ohio State, will all bow into action on the first day of September. WatchABC, WatchESPN, FoxSportsGO, ESPN Plus, ESPN3 and NBCSports.com – are a few of the live streaming online options to follow all the action this weekend. ESPN family of networks, as well as, Fox Sports 1 USA, CBS Network, NBC, Fox USA and the Big Ten Network – are some of the television channels providing live broadcast. Alabama will begin the defense of its College Football Playoff title on a neutral ground at the Camping World Stadium in Orlando, FL, against Louisville. Live coverage of this game will be available on ABC and streaming on WatchESPN, starting at 8:00 pm ET. 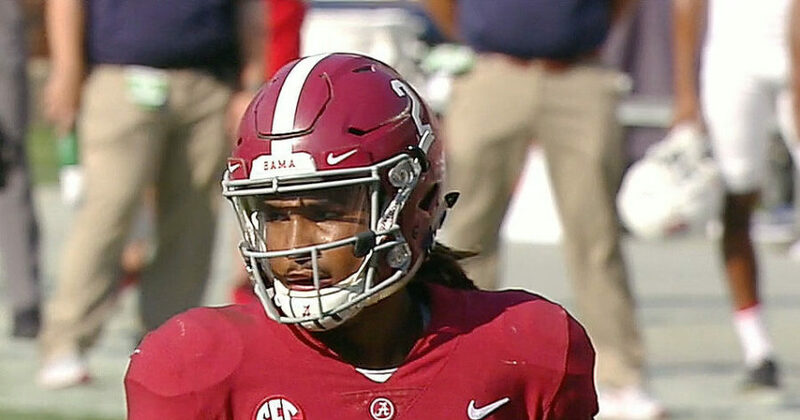 The big news ahead of the start of this game is that Crimson Tide head coach Nick Saban has decided to use both his quarterbacks – Jalen Hurts and Tua Tagovailoa – in the season opener on Saturday. Tagovailoa and Hurts have both been performing well in practice, with Saban revealing last week that they have received equal reps.
“I think we have two guys that are weapons and they’ve both played well, so the plan is to play both guys in the game,” Saban told ESPN’s Chris Fowler in an interview. Although admitting his willingness to play both his star quarterbacks, Saban didn’t go into specifics about playing times. Meanwhile, second-ranked Clemson will take on Furman at Memorial Stadium live on ACC Network Extra with this game set to begin at 12:20 pm ET. Last year’s beaten finalist and third-ranked Georgia will start the season at Sanford Stadium in Athens against Austin Peay live on ESPN and streaming on WatchESPN. Game time is set for 3:30 pm. Elsewhere, No. 5 Ohio State will get its season going without head coach Urban Meyer, who begins his three-game university-imposed suspension, when it hosts Oregon State at Ohio Stadium in Columbus. Meyer was slapped with a three-game suspension for his part in the alleged domestic dispute between ex-assistant coach Zach Smith and his ex-wife Courtney. WatchESPN will have live streaming coverage of this game and ABC will provide the television coverage, starting at 12:00 pm. In other games this weekend, No. 7 Oklahoma entertains Florida Atlantic at Memorial Stadium in Norman, Okla., at Mercedes-Benz Stadium in Atlanta, GA, No. 6 Washington and No. 9 Auburn will battle in one of the two ranked-vs-ranked matches on Saturday. No. 12 Notre Dame and No. 14 Michigan will face-off in the other clash at Notre Dame Stadium.